Nephil, Terran Cosmonaut, Terran Starman. Are all these classes fair and balanced against each other? With this many classes, there is a good chance a few of them are broken, although I have not done enough math to confirm this. If classes stick to the Hit Dice, Fighting, Thievery, Divine, and Arcane model and the names are mostly fluff it could work. If every new class has its own special moves and spell list this system will collapse quickly. Could the number of classes have been reduced by not using a race-as-class model? I think so. While I can no longer complain about the lack of classes in ACKS, I am a little worried that the proliferation of classes offered as a solution will boost the complexity of the game to unmanageable levels. At least I can no longer set ACKS aside as lacking class diversity. P.S. One of the most perplexing features of "Old School Renaissance" is their proclaimed desire for simplicity which they achieve by cutting out classes in their first book, and then immediately destroy in their next supplement by adding classes back in. Although I have to admit this is actually "Old School" since Original Dungeons and Dragons did similar things by adding new classes with every supplement from Greyhawk on. I have been playing Dungeons and Dragons since my Senior year in high school. I have been DMing Dungeons and Dragons since the little white box in the plain brown wrapper came in the mail from Lake Geneva. 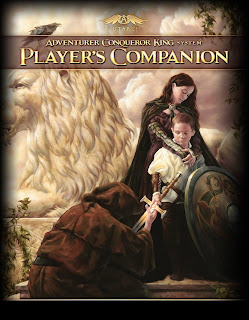 I am currently blogging some of my wisdom from my years of DMing; Notes and Strategies from the games I am running; and reviewing games and modules from my extensive collection.